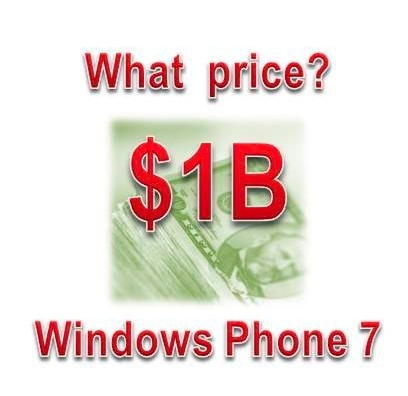 Does $1B Seem About Right to Develop and Market Release 1 of Windows Phone 7? "Microsoft is rapidly developing Windows Phone 7, a smart phone platform to compete with iPhone, Android and BlackBerry. It's due this fall, though we don't yet know the dates, prices and carriers. We do know one thing, the launch will be massive. Like billion-dollar massive." Wilson Rothman, writing on the msnbc.com tech blog Technolog, has postulated that Microsoft might be spending upwards of $1 billion to develop and market the first release of Windows Phone 7. His postulation comes from the consideration of the commentary of various industry people who have speculated on the actual costs. Well known Microsoft watcher Mary Jo Foley from ZDNet is one such resource. This figure might at first appear staggering, but it important to consider what it supposedly covers, and unfortunately none of the sources is being too detailed about what that is. So, they might be close to the mark, or off by 50% or more. No one but true Microsoft insiders will know for sure, of course, but if past reports and speculations are of any merit, these significant technology releases cost big, big, bucks. Rumors of the size of contracts issued to marketing companies always seem to get bandied about. In 2008, for example, Microsoft was rumored to have spent $300 million on a consumer product ad campaign. What we do know for sure is that Microsoft has a lot riding on the upcoming release. This could very well make or break them for years, if not forever, in the mobile phone marketplace. Considering that the $1 billion figure covers both development and marketing, I think it could well be close. What do you think? Whatever the real number is, with the ranges of dollars being speculated about, it appears that Microsoft is serious about marketing the new phone OS. They seem to have noticed that iPhone and Android ads are ubiquitous on television as well as other media. They must participate in that marketplace to have any chance of breaking through the noise. And I am pleased to see they have retained the same firm that has done them well with the Windows 7 campaigns. The fact that almost a year after the release I am still seeing new Win 7 ads on television is a sign that Microsoft is finally listening to the marketing team instead of treating them like an afterthought. If the 1 billion amount does indeed include both development and marketing costs it does not seem a huge amount at all. The cost of the Kin operation was rumored to be more or less the same so personally I think that the WP7 total investments will be at least double the amount of what the analyst suggest. Plus of course the investments to continue the development of the OS which, as it is now, is lacking a lot of features.